She might possibly have the best wardrobe in the world. And I’m not talking about over-priced, over-hyped designer gears, I’m talking about a girl who knows what she likes to wear, what she feels comfortable in, and is not scared of wearing a uniform. Her collections and designs are a direct result of her lifestyle and values, and I like that. I wrote to Jesse a couple of days ago and admitted that my wardrobe gets a cull every so often because it needs to be more “Jesse Kamm.” More classic, more simple, more functional. I’ve been following her journey through Panama (on instgram of course) where she and her husband have designed and built their own home. Dreamy. And the reason to build in Panama? “To surf.” Ah…! SOLD. Anyonegirl: Where are you based? And why have you decided to base your life and work from here? I live in Los Angeles for 9 months of the year, and on Isla Carenero (in the Bocas Del Toro Archapeligo of Panama) for 3 months each summer. I have lived in Los Angeles off and on for almost 14 years now. It is my home. I have tried to leave, by my roots have grown too deep. I love California. I love being warm. I love the sea. I love the quality of life I have here. Surfing brought my husband and I to Panama. We started building a house there 5 years ago. We got married there. We go pregnant there…. so part of me is deeply rooted there in the jungle as well. Anyonegirl: Tell us about your studio? A typical day? Who do you work with? I work from my studio in my home in Mt. Washington. I like to keep my life very simple. I like to spend as much time with my friends and family as I can. I consider my work my “Jobby”. Part Job, part hobby. Some people take fashion very seriously. I do not. Getting dressed should be fun. I like to make people look beautiful and comfortable. I love being apart women’s lives. That part makes me really happy. In a typical week: Two days a week I do the rounds downtown. Everything I make is made right here in Los Angeles. I work very closely with everyone who takes any part in building the clothes. The other days I have clients come to the studio, I draw, I ponder, I wonder through the hills, I make lists, I look at imagery. I like to be organized and efficient. I get everything thing done by 4 pm, so that I can enjoy the rest of the day with my boys. Anyonegirl: I am really interested in this new place you are building in the jungle?! (sorry, instagram!) Can you tell us more!? It is neat eh! I love it so much. I feel so proud of the work we did there. Luke and I designed and built our house ourselves. We were the architects, the contractors, and the builders. It is completely off the grid. The house runs on solar power, rainwater collection, and a composting toilet. It is such a special place for us. We finished the house, and moved in, in June this year. It has really been a labor of love, and let me tell you.. the first night we slept there was the most magical night I can remember. Anyonegirl: Tell us about how you started your line Jesse Kamm. It was completely accidental. I just started making clothes for me, and other people wanted what I was making. I saw an opportunity, and I took it. That was eight years ago. I always thought it was a passing thing. I suppose now I feel rooted into this as well. I used to feel like a fraud because I did not go to school for fashion design. Now I feel very comfortable with what I do. Part of that is me, no longer putting myself in that box. The word “Fashion” can conjures up all kinds of ugly feelings for people. I think it is too exclusive of a word. It harshes my mellow. It really has nothing to do with me or what I am about. I like clothing. I like getting dressed. I like looking good. I like feeling comfortable in what I wear. I love helping other people feel comfortable in what they wear. 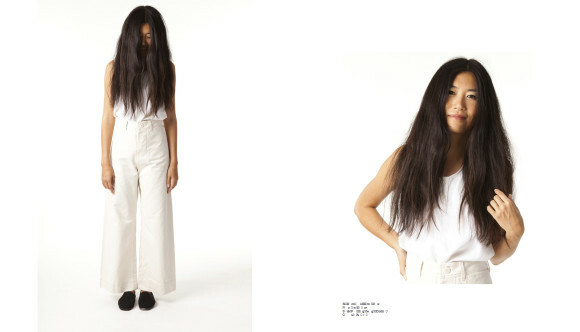 Anyonegirl: Who is the ‘Jesse Kamm girl’ you are designing for? I design for a girl who wants to look good, but wants to feel easy. I make clothes for a girl who is unafraid to wear a uniform. My kind of girl knows what she wants. She is willing to not only invest in it, but is comfortable enough to wear it endlessly. I think my customer cares about where there goods are coming from, and I respect that. Anyonegirl: Tell us about your most recent collection and what motivated it’s designs? Anyonegirl: Your absolute go-to piece is…. 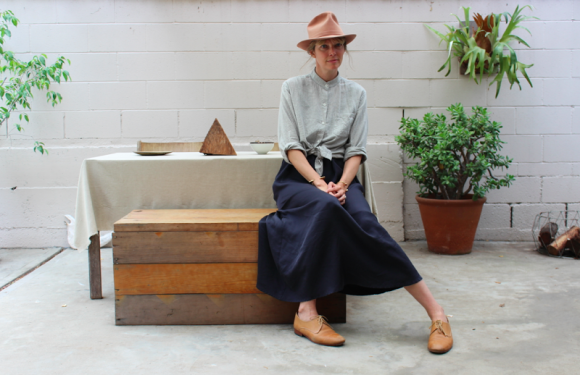 For the last 3 years I almost exclusively wear overalls, a felt hat, and a pair of Dieppa Restrepo oxfords. I have 2 hats, 5 pairs of overalls, and 5 pair of Dieppas in rotation. You can take a girl out of the country, but you can’t take the country out of the girl. Anyonegirl: And if you were going to be a bit fancy, the piece you would grab would be…. The JK Trench coat. I have it in almost every weight and fabric. Oh, and my hot pink lipstick. Anyonegirl: What are some ideas/concepts that are really interesting you right now? Artist’s work you admire? In Fashion: For the last few seasons I have been fairly obsessed with Issey Miyake and the fabrics he created. In Art: I have been really into Don Judd’s furniture design. We have re-appropriated a lot of his designs for our house here in LA, and in Panama. In Film: I have be re-watching all of my favorite Claude Chabrol films, and am always so moved by his work. Day to Day: I mostly moved and inspired by my friends and their work. Hilary Walsh, Katrina Dickson, Sophie Buhai, Eliza Kenan, Claire Oswalt, Jasmine Shokrian, Claire Cottrell, Elisa Restrepo, etc. These are women who are doing great work, raising families, running their own brands, and doing it so beautifully. Anyonegirl: I can see how closely you follow your designs too, right through to the dyeing rooms! Can you tell us about this and why it is important for you. I like to be in control. I like to do everything myself. I do sales, I do press, I do fabric delivery. You know what they say… if you want something done right, do it yourself… And I do, I want it done right. I am running a super small and tight production, and therefor I am able to do all of the things I need to do to keep my mind at ease. I am committed to delivering a certain level of quality to my customer, and I am the one making certain it is delivered. Anyonegirl: I really admire your stand for ethically produced products. On your website it states that 60-70% of the fabrics you use in production are dead stock and remnants. Can you tell us about how you go about sourcing these. I am interested in making as small of an impact on our earth’s resources as possible. It is my way of life. One of the ways I have found to do that, is to use dead-stock. I have a few fabric dealers who deal in small lots of fabrics that went unused by others. Because I have such small numbers, I can take 100 yards of something, which most companies could not utilize. The whole “sustainable” fabric industry is shady, and it is extremely difficult to traverse. I try to be as mindful of my consumption as I can at every step. I make the best choices I can, every day. Anyonegirl: A typical day off for you would be spent…. Coffee. Beach. Tacos. Home again. Bath time. Kid to bed. Breaking Bad. Done. Anyonegirl: Ah, and you surf! Same. Can you tell us what you love about going for a surf? I love everything about it. I love the physical challenge. I love the water. I love waiting for the right moment and then being brave enough to take it. I love wiping out and surviving. I love accepting whatever the sea feels like offering me on any given day. I love being reminded of how small and powerless we are to Mother Nature. I love the feeling of pure exhaustion and calm that I feel when I paddle in at the end of a session. Anyonegirl: What would be your favorite dish to would cook for friends? I am useless in the kitchen. I would drink a smoothie for every meal if I could. I ate a bowl of cereal for dinner. I am hungry now, but I won’t do anything about it. Dang. Anyonegirl: Music that you are listening to right now? Anyonegirl: Favourite magazines/websites you love to read? I read the New Yorker. Cover to Cover. Nope. I come from a long line of non-beauty regime country girls. I try to keep my skin moist in these hot Santa Ana winds!!!!!! Anyonegirl: Anything exciting coming up for you this year? Yes. I am working on a fun collaboration project with my friend Sophie of Vena Cava. It is just a little thing, but it will be a great creative outlet, set for the beginning of December.. 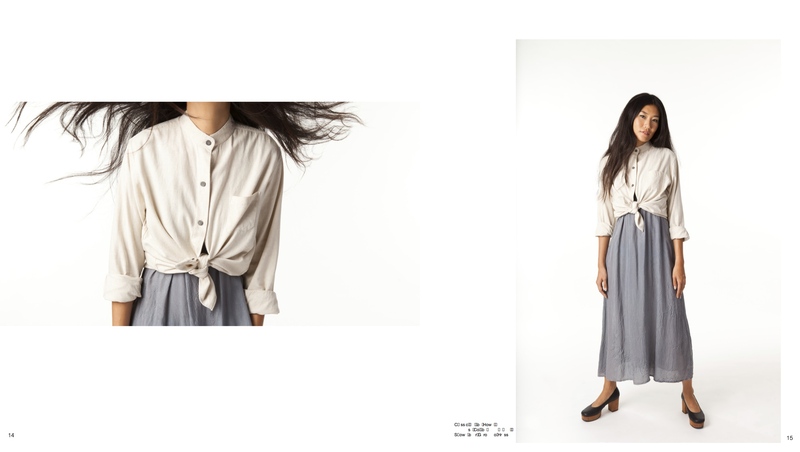 Image above is from Tomboy Style. Below is a selection of my favorite looks from Jesse Kamm’s Spring/Summer 2014 collection, Projection. Jesse Kamm is available from Maryam Nassir Zadeh (NYC) and TEN OVER SIX (LA).